It’s not uncommon for a parent who has lost a child to a vaccine preventable disease to try to spare other families from the same agonizing heartache. In some cases, these children may have suffered with a preventable disease because they were unvaccinated. This could be the result of parents who did not have access to certain vaccines, parents who willfully refused a particular vaccine, or in the case of Riley Hughes, infants who were too young to be fully vaccinated. Riley was a healthy baby boy born in Australia on February 13th, 2015. At three weeks of age he started exhibiting cold-like symptoms with an occasional cough. When he was just 32 days old, Riley passed away in the arms of his parents. 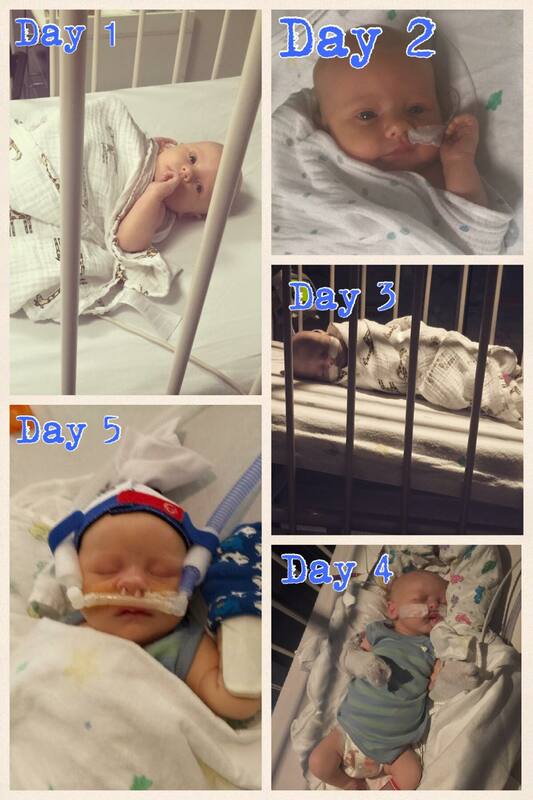 While in the hospital, Riley was diagnosed with pertussis, also known as whooping cough. At that time, the U.S., the UK, Belgium and New Zealand, were already advising expectant women to get an adult Tdap vaccine at 28-32 weeks of pregnancy in order to transfer protective antibodies to their unborn babies. This practice helps protect infants from pertussis at a time when they are most vulnerable to infection and subsequent complications. It’s also the only way newborns can benefit from some protective antibodies before they are two months of age and begin receiving the first of five doses of DTaP vaccine to become fully vaccinated against pertussis. Unfortunately, the Australian government hadn’t adopted this practice until shortly after Riley’s death. Since then, Riley’s parents have made it their mission to educate people about the dangers of whooping cough, and promote the need for vaccination so that no other family would have to suffer like they did. 1. There are no cures for most of the diseases we vaccinate against. 2. Even if you choose not to vaccinate, please, please, please make yourselves aware of the symptoms of these potentially fatal diseases. Infections like meningococcal can kill within 24 hours, and every minute counts. 3. If you’re really worried about vaccine “toxins”, you don’t want to see what the toxins from Bordetella Pertussis (the bacteria responsible for whooping cough) can do. Trust me – I watched my newborn son die from it. 4. If your children contract a disease like measles or whooping cough, they usually have no symptoms in the first day or two – yet they are highly contagious. Keeping them away from others when sick is often too little, too late – the disease has already spread. 5. Your children will grow up, and you will need to be prepared to explain why you chose to leave them unprotected from serious disease. 6. Vaccines are not perfect. Like condoms… there’s a failure rate. There’s also a tiny chance you might have an allergic reaction. But they protect you from a hell of a lot of nasty stuff. 7. If you are worried about where to get good and unbiased information from, speak to someone who has worked in intensive care. They have seen patients with vaccine-preventable diseases. And if someone was in a serious way from a reaction to a vaccine, they would have seen those patients too. I have never met an ICU doctor/nurse who is against vaccination. 8. Be wary of those selling books, memberships, and alternatives to vaccination. They have rea$on$ for trying to convince you to not vaccinate. 9. In the time you have spent reading this, a few more children under the age of 5 have passed away from a vaccine-preventable disease somewhere in the world. These diseases are serious, they are deadly, and they are preventable. 10. It’s not too late to change your mind! Light for Riley is a project of a foundation that Riley’s parents have helped establish called the Immunisation Foundation of Australia. Like Every Child By Two’s Vaccinate Your Family program, the Immunisation Foundation of Australia provides evidence based information to help parents learn more about the dangers of preventable diseases and the benefits of timely vaccination. When it comes to preventing pertussis among infants, research indicates that maternal vaccination has been quite effective. The latest study published in Pediatrics earlier this month demonstrates that maternal Tdap vaccination during pregnancy has effectively reduced the risk of a child contracting pertussis by over 90% in the first 2 months of life and the risk continues to be low throughout the first year of life. The same is not true in cases where parents received Tdap after pregnancy. In these scenarios, cases of infant pertussis did not significantly decrease, thus emphasizing the importance of vaccine timing in passing on critical pertussis protection. 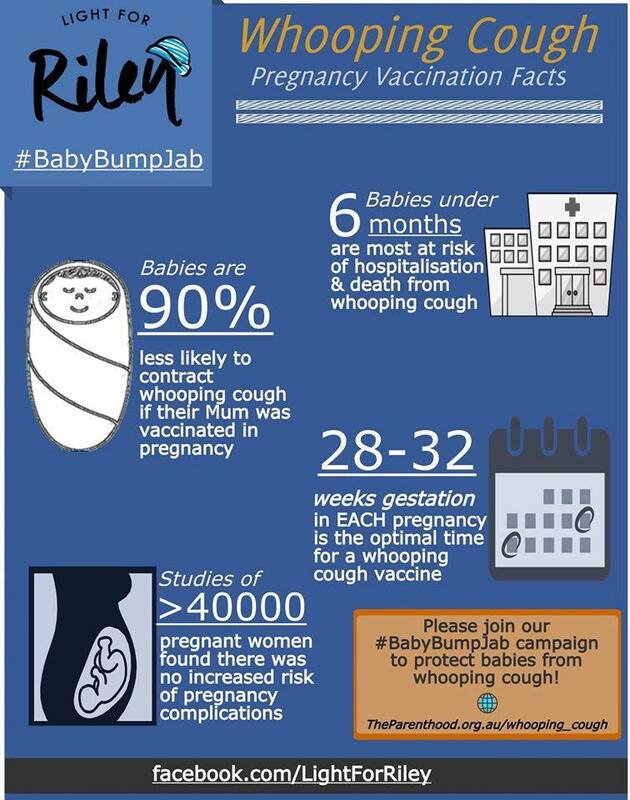 While it is encouraging to know that maternal vaccine recommendations are helping to spare babies from the same fate as Riley, organizations like Every Child By Two and the Immunisation Foundation of Australia will continue to inform parents about the need for adult Tdap vaccination during pregnancy, not after delivery, in order to ensure no child is left unprotected, because sadly, whooping cough outbreaks still occur in the U.S. Currently, the Advisory Committee of Immunization Practices (ACIP) continues to recommend that pregnant women get an adult Tdap vaccine to help protect their newborn babies from pertussis. Additionally, close family members and caregivers are also advised to receive a Tdap booster at least two weeks prior to the anticipated arrival of a newborn baby. For more information about the vaccines recommended during pregnancy, as well as vaccine recommended for infants, children, teens and adults, check out our Vaccinate Your Family website. There are no cures for most of the diseases we vaccinate against. -Vaccines are not a cure either and only offer limited protection in exchange for risk of injury and health. If you’re really worried about vaccine “toxins”, you don’t want to see what the toxins from Bordetella Pertussis (the bacteria responsible for whooping cough) can do. -Sorry one episode of whooping cough doesn’t compare to 72 doses of vaccines. If your children contract a disease like measles or whooping cough, they usually have no symptoms in the first day or two – yet they are highly contagious. -Just as recently vaccinated kids are contagious. Your children will grow up, and you will need to be prepared to explain why you chose to leave them unprotected from serious disease. -My child will thank me for not poisoning them and for keeping them healthy. Please provide the PubMed indexed studies by reputable qualified researchers to support that claim. @Kurt – what a bold-faced lie. Hi Lawrence. 8 pm is kind of late for you. When do the orderlies turn off the router? Chris, you know the recently vaccinated are contagious, why are you playing dumb? Why do you suppose they don’t want the recently vaccinated in hospitals or around people with cancer? Lawrence, which of my statements is a “bold-faced” lie? Would love to discuss it. Chris, right from the CDC..
Kurt, there was a reason I specified PubMed indexed studies. That Weston Price article had nothing. The CDC link in no way proves that those who have just received the DTaP or Tdap are infectious after vaccination. Again, please provide the PubMed studies by reputable qualified researchers to support your claims. 1) no one said vaccines were a “cure,” but they do prevent disease from occurring in the first place. 2) 72? I thought you anti-vaxers said it was 69. The antigen load from all vaccines a child is given is still less than what they would have to handle from a single real infection. 3) the recently vaccinated are not “contagious.” That’s your bold-faced lie. The rest is merely you providing misinformation and horrible sources. Just more scare tactics and the ignorant inability to take care of an illness, properly. Pharmaceutical companies profit from vaccines, in fact if you want to talk profits then let’s be honest about who is really profiting from vaccines , pharmaceutical companies and vaccines are publicly traded and are required by law to profit, the pharmaceutical companies pay doctors for higher rates of vaccinated kids, the amounts can be in the millions that a doctor is paid in bonuses for vaccinating children, the pharmaceutical companies profit from the vaccines as well, big time !! My children are grown now, I have one who was vutill her fourth year requirement was met, I learned (almost by loosing one child) that vaccines don’t help, don’t work, and can harm or kill! (Thank God I didn’t loose my son) but no, you call parents who have witnessed the negitive effects of vaccines crazy, well I’m not the crazy one here and I’ve done my research, backed by my doctors by the way, and approved by every doctor I’ve ever had! 1) The vaccine is designed to protect the baby, by preventing the mother was getting a disease (like Influenza) which could cause harm to the baby. 2) Pharma companies do profit from vaccine sales, but total revenue for all vaccines, globally, is less than $30 Billion dollars (revenue, not profit). This represents less than 3% of all Pharma revenue total. Vaccines have the lowest profit margin of all pharmaceuticals – because they are only given once (or only a few times over the course of a life) but they are still required to go through the entire FDA clinical trial process (and post-release surveillance). 3) Insurance companies, which have a vested interest in not paying to treat diseases, are the ones who have the incentives for vaccination. It makes fiscal sense for them to prevent disease outbreaks, since treating diseases is much more expensive than preventing it in the first place (i.e. $100 for the MMR vaccine vs. $10,000 to treat a case of measles in the hospital). 4) These diseases have killed, do kill & will continue to kill (and cripple) as long as people continue to be infected. (Just a side note, if doctors were paid “millions” to give vaccines, and there are tens of thousands of pediatricians in the US, and millions globally, where is all this money coming from? Because it isn’t coming from selling the vaccines, that’s for sure). Your anti-vax logic just falls apart. Oh, and the part where you state that “Polio isn’t a virus.” Well, that’s just supremely ignorant. Lawrence – so the only statement of Kurt’s you actually dispute is that the recently vaccinated are not contagious? This after calling him a bold-faced liar? Kurt has a good point. If the recently vaccinated aren’t contagious then why aren’t they allowed in hospitals and cancer patients, etc etc?? No, I dispute everything he wrote – but the statement that the “recently vaccinated are contagious” is a bold-faced lie. The rest is misinformation, misinterpretation or just lies by omission. There is a difference. And since people are actually vaccinated in hospitals all the time, I’m not sure why you think you have a valid point. And even Johns Hopkins revised their visitation policies years ago – the sign that anti-vaxers keep trying to use to justify this is way out of date & not reflective of existing policies. So tell us the proper way to treat measles encephalitis or the massive muscle spasms from tetanus. Support you answer by providing the PubMed indexed studies by reputable qualified researchers that your methods work at least 90% of the time and are much cheaper than preventing the diseases. Catryna, also provide the PubMed indexed study that your method to keep newborns with pertussis alive works 90% of the time, and is much much cheaper than hospital care. Prove that you could have kept baby Riley alive. Lawrence, now that is a bold-faced lie. Here’s a little fact for you…. Some vaccines are made using weakened, but live, viruses,and the virus can be detected for a short period of time in the recently vaccinated person and that can lead to others being infected with the vaccine version of the virus. JulieO, please post the PubMed indexed studies by reputable qualified researchers to support that statement, and is actually a cause for concern. And yes, your veracity is being questioned because of your previous statements were refuted by actual federal laws. And do you know what happens if a person happens to come in contact with a weakened, vaccine antigen? They don’t get infected, they get a boost to their immune system. You really don’t understand the science behind vaccines & immunology in general, do you? LOl Chris, what does a law have to do with anything if people don’t follow the law? And guess what, they don’t – obviously. So you saying that a sheet it given out every single time to every single person is completely F-A-L-S-E, false. During a viral infection, live virus is shed in the body fluids of those who are infected for varying amounts of time and can be transmitted to others. Wow. I’m sure you didn’t bother to read your citations, because none of them actually say what you think they do. The first three have nothing to do with vaccination at all & instead talk about how viruses spread and infect. The fourth does at least mention “shedding” but merely pointed out that some vaccine antigens were found in the subjects saliva. Again, nothing to do with actual “shedding” to cause infection. The fifth, well, I’m sure you didn’t bother to read the actual literature – and I don’t know too many adults that actively play with poop or eat it. And the last one – well, you certainly are stretching, since OPV hasn’t been used in the United States in decades. I also noticed that none of your citations had anything to do with the MMR vaccine. In fact, the only vaccines noted are an experimental HIV vaccine (which hasn’t been approved), the Rotavirus vaccine, which is oral & only given to children, and the OPV vaccine, which is only used in a few distinct areas and is no longer used in the United States (and as I noted, was discontinued decades ago). You’re grasping at straws and failing miserably. All I see is “potential” no actual transmission. Those links were provided to give you a lesson in viruses in shedding. It’s too bad that you don’t have the capability to understand what you are reading. But that’s how people who are full of themselves are. I thought Hospital’s didn’t care about the recently vaccinated Lawrence? Apparently, St. Jude Children’s Hospital does. Having studied immunology and advanced chemistry, with a smattering of epidemiology as well, I am more than capable of evaluating what you presented. It is obvious that you don’t understand the differences between a wild virus and even a live, attenuated virus used in a vaccine like the MMR. And just looking around, tens of millions of vaccines are given each and every year – hundreds of thousands per day – if “shedding” was actually a concern we’d see tens of thousands of cases per month of new infections. But we don’t….I wonder why that is? Again, it really doesn’t say what you think it does. That’s a pretty sad response….a press release from a notorious anti-vax organization? Yes, there are a lot of diseases out there and we don’t vaccinate against all of them. But perhaps you should ask the 40 million people who have died of AIDS (if you could) if they were afraid of it? As I stated earlier, Johns Hopkins’ visitation statement says no such thing and hasn’t for years. Hey Kurt, nothing about vaccine shedding, I see. Do we have any proff that the babies of the mothers who receive the DTaP actually have anti-bodies? Studies are not done on pregnant women, as it is unethical, so how do we know if there are protected or not. Also did Riley receive any other vaccines himself? Such as Heb B? What works is vaccine marketing. Fear is a great motivator of the ignorant. Well, this ought to be good. So, where did all the diseases go? Then tell us why the rate of measles incidence dropped 90% in the United States of America between 1960 and 1970 based on US Census data from the 20th Century. Provide actual scientific references to support your answer. The blue letters in the above article are links to other pages, including scientific papers. Go re-read the following paragraph in the article again, and hover your mouse over the blue words, see the pointer turn into another shape and then click on it. By the way, there are lots of studies done on pregnant women. That epidemiological study was done using the anonymized medical records of a large health maintenance organization. And what’s your alternative? Listen to a bunch of quacks? I am sorry but grammatically fractured anecdotes are not actual verifiable evidence. Yes, it is a trillion dollar industry, so what? If one has type 1 diabetes, should one not use insulin because its manufacturer makes a profit? If one has asthma, should one not use albuterol because, again, its manufacturer makes a profit? Making a profit does NOT validate or invalidate any medical procedure or drug. Pharmaceutical companies makes a profit on drugs that confer a clear benefit, those that are iffy, and those that are eventually withdrawn from the market. When it comes to vaccines, the entire global sale represents around 2% of pharmaceutical sales. In addition, more expensive drugs could be used for hospitalized kids suffering from vaccine-preventable diseases. One can argue that the pharmaceutical industry charges too much; but each pharmaceutical product should be evaluated based on the research, biological plausibility, and history and vaccines have been shown to confer benefits that far outweigh the rare, albeit, sometimes tragic adverse events. For instance, prior to introduction of the vaccine, measles alone in the 1950s killed between 400-500 children, caused permanent disabilities in another 1,000, e.g. deafness, blindness, seizure disorders, and mental retardation, and hospitalization of around 50,000. Unless you prefer a system where the government develops all drugs and vaccines and supplies them for free, we are stuck with our for-profit system and since everything manufactured is sold for a profit, it is absurd to use this as a litmus test for any products value. Millions more vaccines are given to children over 1 year old. So, 1500 is less than 1/1000. Now compare this to the risks from the vaccine-preventable diseases. For instance, prior to introduction of the vaccine, measles alone in the 1950s killed between 400-500 children, caused permanent disabilities in another 1,000, e.g. deafness, blindness, seizure disorders, and mental retardation, and hospitalization of around 50,000. Prior to the advent of antibiotics, 1,000s died from bacteria pneumonias following measles infection. Measles is just as contagious today, our population has more than doubled, and antibiotic resistance is on the rise, so one could easily imagine without the vaccine, 1,000 deaths, 2,000 disabled, and 100,000 hospitalizations. Then add in polio which prior to the vaccine caused around 15,000 crippled kids per year, so, as it is just as contagious today, we could expect around 30,000. If one adds in all the vaccine-preventable diseases, then the number of petitions would approach, perhaps, 1/2,000 to 1/3,000. In other words, for every vaccine-associated harm, 2-3,000 natural disease harms are prevented. I don’t downplay the tragedy of even one child being harmed; but, given that one can’t know which child would be harmed from the vaccine and which from the natural disease, any reasonable person would opt for vaccinations. We don’t live in a perfect world, things aren’t black and white. Vaccines don’t provide 100% protection nor guarantee no adverse events; but they are exponentially better than risking the natural diseases. From Wikipedia: “Common complications include pneumonia, bronchitis, encephalopathy, earache, and seizures. Most healthy older children and adults fully recover, but those with comorbid conditions have a higher risk of morbidity and mortality. I double-checked from other sources for the accuracy of the above stats. I use Wikipedia because it is easily accessible to the reader who can, in turn, check out the stats. The shed virus are weakened/attenuated and the shedding lasts only a few days. As they are attenuated, they are NO risk for healthy people. As for avoiding those undergoing chemotherapy or with immune diseases, first, they would be at even greater risk from the natural disease which would be everywhere if not for vaccinations and second, I avoid visiting friends undergoing chemotherapy or with some immune diseases even if I have a common cold or wear protections. I imagine that you have heard the old saying, “the glass is half full or half empty.” With vaccines, the glass is 98-99% full and you choose to point out that it is 1 -2 % empty. If we used your approach, we would reject almost all of modern medicine. I just love how he trivializes injuries from actual diseases, and ignores the fact that some vaccines were replaced by safer versions to reduce vaccine injury. 2. Claim the vaccine-preventable diseases are not caused or, at least, not serious until someone exposed to, for instance, DDT, arsenic, etc. 3. Grossly exaggerate the risks from vaccines, often using VAERS, which would be like assuming everyone brought in by police for interrogation is guilty. 4. Minimize the protection conferred by vaccines. For instance, flu vaccine only 30%. Actually, most flu vaccines protect against three strains and only one represents 30%; but what does this mean? It means that it doesn’t protect against getting that strain; but still reduces also risk of hospitalization and death. 5. Cherry pick articles or finding one or two “scientists or doctors”. Any scientist knows that even the “best” of research is subject to uncontrolled/unknown random factors which is why replication is essential. And, for instance, there are over one million people in US with MDs. Some are drug addicts, some alcoholics, some bipolar disorder, etc. Getting through med school doesn’t mean one understands science or thinks rationally, just that one had the ability to learn and regurgitate information and act appropropriately for the moment. 6. Ad hominem attacks and profits. As I wrote, everything we purchase is sold to make a profit, otherwise companies would not stay in business, so meaningless critique. And ad hominem absurd. Basically, if they can’t scientifically and logically find fault, they attack the person or persons. Besides showing their ignorance, it also displays their lack of any ethics. So they are basically dishonest, or just very very clueless. I just love how Chris trivializes injuries from actual vaccines, and ignores the fact that some diseases are not that threatening, ie chicken pox. I don’t need a calculator when over $3.6 billion has been paid out for vaccine injuries. Actually, you do, because that number is spread across 30 years, which equates to only about $90 Million per year paid out in actual settlements (minus legal fees). In contrast, most that $120 Billion (with a B) is paid out each and every year for car accident claims. Which means, over the same period of time, more than $3 Trillion (with a T) has been paid out for car accidents. So vaccines, by just this measure, are 100x safer than driving a car. From 2006 – 2015, 2911 claims were paid. In the same period, 2.2 Billion (with a B) vaccines were given. Divide 2911 by 2.2 Billion & you get 0.00013% or in layman’s terms, 1.3/10,000ths of 1 percent. Which means that you, or anyone else, has a better chance of being struck by lightning twice, than you do suffering from a serious reaction to a vaccine. So, when you compare the millions of people who used to suffer from disease, to a literally less than 1 in 1 million chance of a serious vaccine reaction, the numbers speak for themselves. The numbers are, in fact, trivial – though no one will trivialize the very small number of actual real reactions, they do pale in comparison to what we used to experience before vaccines. For instance, Schools for the Deaf and Blind are nearly extinct in the United States – primarily because the vaccine-preventable diseases were the #1 cause for juvenile deafness and blindness. Since kids don’t get those diseases anymore, because of mass vaccination, they don’t go deaf or blind. This isn’t rocket science, this is real science. $3.6 billion has been paid out for vaccine injuries over more than 30 years, so, approximately, less than $120 million per year. The US does not have a comprehensive universal health care system, so each pay out must take into account a lifetime of medical and supportive care, depending on the extent of the injury. Thus, many payouts are for around $1 million, some less, so, on average, perhaps, 200 – 300 cases per year, again, compared to over 10 million vaccinations per year. And, as I and others have written, just measles alone would be responsible for around 1,000 deaths, 2,000 permanent disabilities, and 100,000 hospitalizations, that is, assuming antibiotic resistance doesn’t increase the number of deaths. Add in all the other vaccine-preventable diseases and there could easily be 50,000 or more disabilities, and several hundred thousand hospitalizations. How much do you think all this would cost? No one is trivializing injuries from vaccines; but compared to the risks from the natural diseases, one has to make a decision. Try actually reading my comments above and try to actually understand them. A few people each year are injured in minor traffic accidents by seatbelts; but 10s of thousands of lives and serious injuries are prevented, so, should we stop using seatbelts? As for: “some diseases are not that threatening, ie chicken pox.” Before the varicella vaccine became available, chickenpox was responsible for about 100 deaths and 11,000 hospitalizations each year. Since our population has more than doubled and chickenpox is just as contagious, one could expect without the vaccine around 200 deaths and 22,000 hospitalizations. Since vaccination, the number of deaths declined by about 88%. In addition, there are a number of other complications from chickenpox; but I won’t bother mentioning them. In the 1950s, many women stayed at home to take care of kids, today, over 70% or around that number work, that is, both parents work. So, without vaccines, kids would miss several weeks of school from the various vaccine-preventable diseases and many families would lose valuable income as one stays home to take care of the kid and, of course, the kids have to suffer. Despite the Brady Bunch depiction of measles, it is not a pleasant disease. Intense itching, high fever, loss of appetite, and general malaise. I think you and Kurt should apply for membership in the International Flat Earth Society. I’m sure they would welcome with open arms your lack of understanding of science, medicine, history of diseases, and critical thinking; but, yes, get out your calculator and try dividing by 0. JulieO, can please tell us the ratio between the number of vaccines given and the number of NVICP compensated claims? Please post the PubMed indexed studies by reputable qualified researchers that any vaccine on the present American pediatric schedule is more dangerous than the diseases. So are you also cool with those hundred deaths, just like you are okay with kids suffering high fevers and pain, plus the bonus of shingles later in life. That makes you a terrible person. So how many hospitalizations and deaths happened last year due to the varicella vaccine. Provide actual verifiable evidence. By the way, as I have mentioned before, just like giving Kurt that little math problem that he refuses to do: my kids all got chicken pox in 1994. This was a year before the varicella vaccine was available. The youngest was six months old. Neither of us got much sleep for almost two weeks, and some of those poxes were very close to her eye. Since she had it so young she has a very high chance of getting shingles in her twenties, especially when under stress. She starts grad school in the fall (hint: it will be stressful). I really really do not think kindly of those who think children should suffer from vaccine preventable diseases. So both Kurt and JulieO better bring up some real good PubMed indexed studies showing how vaccines are so much more dangerous than the diseases. Oh no you didn’t get much sleep boo-hoo-hoo. If you get the vaccine you also have a high chance of getting shingles. As I said, the ratio doesn’t matter, the $3.6 billion in injuries matter. So you are cool with deaths via vaccine, just like you are okay with kids suffering serious injuries by vaccines. That makes you a terrible person. Only a sadistic child hating person would want children to suffer from those vaccine injuries. Wow, you really don’t care if a baby is in pain. You really are a terrible person. Actually no. And you have absolutely no evidence that it happens in greater numbers than the vaccine. Really, did the varicella vaccine kill a hundred children last year in the USA? Come on, show us evidence of those numbers. Until then, you are the worse person. Wow, you really don’t care that children are injured by vaccines. You really are a terrible person. You think that two weeks of inconvenience and not sleeping is worse than children that are seriously injured by vaccines, so you are definitely a horrible person. Where are those children? Provide the statistics showing they exist in numbers that equal the injuries by the diseases. Prove they actually happen with actual evidence. And if you bring up the NVICP again, be prepared to show compare the number of vaccines given (which is in the billions) to the number of compensated claims (which is is lots less than 3000). Also, kids are now given the DTaP instead of the DTP. Plus the RotaShield vaccine was removed from the schedule, and several years later two safer rotavirus vaccines were introduced. Now there are fewer children suffering from that very nasty gastrointestinal disease that actually caused seizures. So where are your data, JulieO? Stop making babies cry, and get those PubMed indexed studies by reputable qualified researchers that any vaccine on the present American pediatric schedule causes more harm than the diseases. The reason that oral polio vaccine could be removed was that a newer version of the killed vaccine had been developed. The original polio vaccine was only about 90% effective against two of the strains and 70% effective against the 3rd strain of polio. While the Salk vaccine reduced the numbers from around 15,000 to 2 – 3,000 cases of paralysis, the Oral vaccine ended natural polio in the US; but did cause around a half dozen. In other words, since no one knew if their child would be crippled by the natural virus, the odds were 2 – 3,000 to 6. So when Salmone testified, the absence of natural polio, plus the new killed vaccine was what led to eliminating the oral. If the new killed vaccine had not been developed, it would have been foolish to stop with the oral since polio was still raging around the world and only a plane flight away from the US and potentially a new epidemic. And the oral has been used by the WHO in their quest to end polio since humans are the only natural reservoir. As for the DTP, later studies found that the risks from the vaccine, though higher than from DTaP, it also confers higher levels and longer lasting immunity and is still being used around the world. The Rotashield vaccine did cause a few cases of intussusception, except in very rare circumstances, quite treatable, so when they removed it from the market, it meant 30 – 40 deaths per year and up to 50,000 hospitalizations during the half dozen years until the safer vaccines were developed and approved. Again, a few cases of intussusception vs 30 – 40 deaths and 50,000 hospitalizations. So, yes, safer vaccines were developed and approved and eventually even safer vaccines; but the picture is a bit more complicated. In every case, the vaccines that were removed in the US protected exponentially more children than they may have harmed and, yes, even one harmed child is a tragedy; but in the real world decisions have to be made, do we avoid the rare risk at the expense of the many certain risks from the natural diseases? Joel, the IPV still predates the OPV… even with the improvements. Salk had his doubts about the OPV (and Sabin). There are still debates on using OPV, IPV or a combination of the both (learned by listening to a podcast by a polio virus researcher call “This Week in Virology”, his blog is http://virology.ws/ ). Your notes on the different vaccines are duly noted. I just posted a summary of them to show that we know vaccines are imperfect and strive to make them better. Do you think either Kurt or JulieO would understand those complications? I tried to keep it simple for them. And, yeah, as a parent whose child had a seizure from a rotavirus infection I do think about the children who had to suffer from in between the removal of RotaShield and the approval of RotaTeq (like the folks in this story: https://vaccinesworkblog.wordpress.com/2017/05/16/how-a-bout-of-rotavirus-made-me-appreciate-vaccines/ ). But what kind of backfire affect would we get by just mentioning a vaccine that involved the participation of Dr. Offit? Who in their universe is “Dr. Evil”! Look, neither of them have a clue. JulieO trivialized a six month old baby with chicken pox, and even mocked the baby’s lack of sleep. She had no clue it was because the baby was in pain and constantly crying. She even she mocked our lack of sleep (which can be medically dangerous, especially when one has to operate a motor vehicle to get certain things done). This is the depth of ignorance and denial of those who cannot be persuaded from a position that they fell into without any thought. Wait. “Without any rational thought” is perhaps a better description. Still, our comments are really not for them, but for those who are undecided and looking for rational discussion. I wish people would actually read what I wrote. I said that the IPV came first; but it did not confer more than 70% protection for the most virulent of the three strains and 90% for the other two so that the number of cases plummeted with its advent; but still remained at 2 – 3,000. And I’ve read just about every book and many, probably over 100 journal articles, and Salk was wrong. One can applaud him for developing the first vaccine against polio that worked; but his arrogance also contributed to the Cutter Incidence and he was against a double-blinded randomized clinical trail, so that half of the 1.6 million kids in the trial of the vaccine were not randomized, but the other half was enough to draw valid conclusions as to the vaccines effectiveness and safety. The debates about the IPV vs Oral that are still going on are about as valid as claims made by antivaccinationists. If we had not used the oral polio vaccine and continued with the first IPV or removed the DTP without the DTaP or what happened with the rotavirus, what would we tell parents whose children suffered from the vaccine-preventable diseases? No Kurt or JulieO obviously are clueless and probably don’t want to even consider anything that challenges their ignorance. I am truly sorry your child experienced a seizure following rotavirus vaccine. Were there any long term effect? Many children experience a febrile seizure at some time, frightening for the parents; but with no lasting effects. Hopefully, such is the case with your child. Sorry, Joel. You are a victim of TL:DR syndrome. You do seem to go very long, and in order to get the point across I try to keep things short. Are you really so dense and defensive? You wrote that IPV preceded the oral in response to my comment as if I didn’t already include it. In addition, you mentioned Salk’s disapproval of the oral vaccine and the so-called controversy, so i simply refuted this. Keeping things short is one of the approaches of antivaccinationists. Things aren’t always so cut and dry that one can make overgeneralized simple statements. So, feel free to continue to attack me if you feel the need. One of the things that bothers me is not just antivaccinationists; but even those pro-vaccine who based their approach on similarly weak arguments. And I asked about your child. Are you incapable of a simple reply? No, I am not, I defer to your expertise. But to each their own. I am just saying that sometimes you need to keep it simple for those who are clueless like Kurt and Julie. Also, the actual audience we try to reach out to are not the folks like Kurt and Julie, but to the lurkers. All we can do is point out the dishonest tactics used by Kurt and Julie, and try to avoid the backfire effect. Which is very very difficult. Also we have no idea of the long term effect of the rotavirus seizures. He severe speech disorder may or may not be from his seizures according to the neurologist. It obviously had nothing to do with his obstructive hypertrophic cardiomyopathy. And it really doesn’t matter, because rotavirus is not something any family should go through (imagine rivers of poo). Nor should any baby suffer from chicken pox. 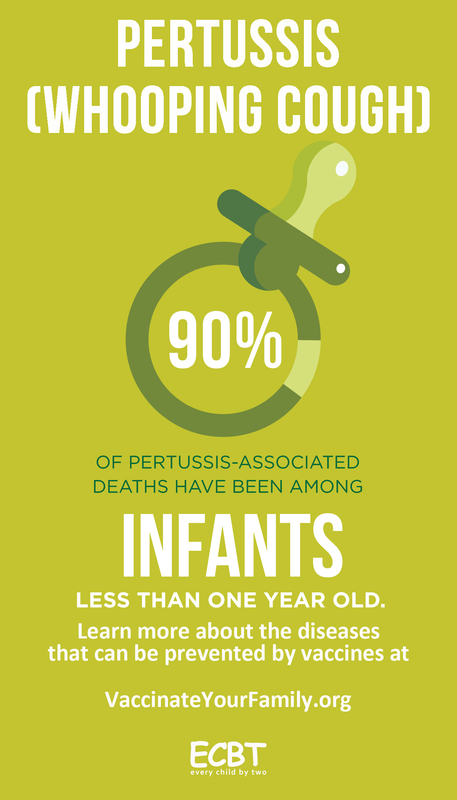 Plus no one should cough their lungs out for two months because of pertussis. Also pneumonia must be avoided, which is why there are vaccines to prevent several pneumonia causing diseases. And there are vaccines that prevent the diseases that cause encephalitis, something a parent never wants to see in their child. I explained why the oral polio vaccine was necessary, that the original IPV only protected against the most virulent of the three strains by 70% (see my comments above). Well, your keeping things short plays right into the antivaccationists narrative. By ignoring what I wrote and bringing up what Salk thought and the alleged debates, this is exactly what they want to hear. Quite simply, by telling them that the oral vaccine may not have been the best choice, they can then believe that if historically choices that were made were controversial, then why should they trust current choices. As I wrote; but you had to put your two cents into it, the oral vaccine eliminated the remaining 2 – 3000 cases of paralysis with the tragedy of a half dozen or so caused by the OPV. Since the improved version of the IPV did not arrive until the late 1980s, not using the OPV over 30 years would have resulted in between more than 60,000 and 100,000 additional cases of paralysis vs 200, perhaps 300, cases caused by the vaccine. In addition, only between 1 in 100 and 1 in 200 infected with polio developed paralysis. It wasn’t random, more than likely a genetic predisposition and some other factor. So, if the virus had not been totally eliminated from the US thanks to the OPV, the likelihood is high that at least some of the kids paralyzed by the OPV would have ended up paralyzed from the natural virus. This doesn’t make even one child paralyzed less of a tragedy. In any case, what you wrote plays into the antivaccinationist’s narrative. I don’t write for the Kurts and JulieOs of this world; however, by not giving a clear explanation to rebut their claims, I leave those looking for answers without the ammunition they need. Sometimes simple answers just don’t do the trick and if people rely on them, then they can easily be persuaded by additional simple answers from antivaccinationists. It is important that people understand the reasoning behind decisions, not just the decisions. SO, I gladly plead guilty to being TL:DR. In fact, I take pride in it if it ensures that I don’t give oversimplified answers that reinforce the illogical unscientific antivaccinationist narrative. By the way, the Cutter Incident is another example of how antivaccinationists build their narrative. It wasn’t a polio vaccine manufactured properly that was the problem. The clinical trials where almost one million kids received the vaccine resulted in no problems and Sweden produced their own IPV with no problems. What antivaccinationists fail to understand is that if we reject any product not properly prepared then almost nothing would be left. Spinach, sprouts, chicken, eggs, all contaminated with salmonella. Hamburger with e-coli. No one is calling for banning spinach, sprouts, chicken eggs or hamburger. And many more examples. And, despite the tragedy of the Cutter Incident, it led to much more stringent vaccine regulations and oversight. Regarding your child, I am sorry to hear about the obstructive hypertrophic cardiomyopathy. You originally wrote: “as a parent whose child had a seizure.” Your later comment stated: “the long term effect of the rotavirus seizures.” If it was seizures, not seizure, then my statement regarding “febrile seizures” probably doesn’t apply. In any case, I really hope he/she will improve. Improvement is objective. Since his phenotype is so different from his siblings, we suspect a de novo mutation. There is a program to find these rogue genetic sequences, along with many others. But one needs to fill out a questionnaire. I would love to do it, but he is over eighteen so he must do it himself. He has been encouraged many times, but it will not happen. So any family with autism is encouraged to be one of the fifty thousand families to participate in https://sparkforautism.org/ . They have found over half of the genetic sequences that cause autism. Late at night: Improvement is subjective. One more thing, Kurt: all those awards of compensation totaling in the billions over several decades? More than 90% of those compensated were compensated for suffering a table injury. Compensation for table injuries represent a settlement, where no finding is made that the vaccines received caused the injuries being compensated for..
That is no fault of the injured. If it was agreed upon ahead of time that table injuries would be paid automatically, then so be it. Are you trying to say they weren’t injured???? They suffered a severe reaction, which according to the terms of the NVICP, could potentially be linked to the vaccine. How can a recently vaccinated person be contagious when they were inoculated with a killed virus? No matter how long its been since you were immunized, your body will always have some kind of immunity to the virus you were immunized against. When you have just a small amount of antibodies stored, you can still get the disease you were vaccinated against, but the severity of the disease is far less than if never immunized at all. Because the severity of disease is significantly less, risk for complications is also significantly less. I have no source because this is what they teach us in college, ya know, where we earn ACTUAL, accredited degrees? Those who have obtained those REAL, expensive pieces of paper, wont need a source.